Anglo-Saxon military organization is difficult to analyze because there are many conflicting records and opinions as to the precise occurrences and procedures. Anglo-Saxon England was known for its tumultuous nature and the constant presence of outside threats and dangers made it necessary for a solid military to be constantly in place. However, in spite of this, by the 10th century, the Saxon kingdom of England was, perhaps, the best ordered state in Europe with a highly efficient administration that had a solid currency and could raise taxes to support a military establishment. Even though there is some controversy as to the accurate forms of military organization, some aspects can be deduced from the records that have been preserved. The period can, however, be split into two: before settlement, AD 400 to AD 600; and the settlement period, when the Saxons had established organized kingdoms, AD 600 to AD 1066. 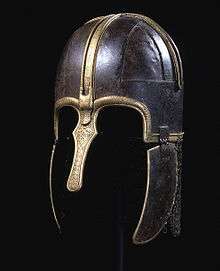 The Coppergate Helmet dates to the Anglo-Saxon era. The Gedriht were the personal followers of the chief and were sworn to die with him. There would have been few of them in each warband. They would have been well armed and the majority would have worn a helmet and chainmail armour. The main weapon was the Gar, a 2.5 m long spear with an ash shaft (Old English, gar = spear). Many would have carried long slashing swords. The second group were the Geoguth, or young warriors. They would have formed the bulk of the warband and would have carried a shield, spear, and Seax (a single edged dagger or short sword). Few would have had helmets or defensive armour. The Duguth, or old warriors, appear later in this period. They would have carried the same equipment as the geoguth and served mainly to provide a stabilising element in battle. In addition, there would have been skirmishers armed with either a bow or sling. This appears to have changed during this period. At the beginning, the shield was small, more like a buckler, and suggests that the men fought in open order. Later, the shield was enlarged (up to 1 m across) and the warband fought in close order, which required a reasonable level of training and discipline. This style of fighting had a long history; it was known as a shield wall or phalanx formation. The use of the horse in battle is very unclear and probably only the gedriht would have had them. However, horses at this period were small and would have had to be battle trained. On balance, the sources indicate that the Saxons fielded a balanced and effective infantry army. It seems likely that horses would have been used either for scouting or transport. It is not clear how large armies were; the Saxons themselves described anything more than 30 warriors as an army. Interestingly, this would have been about same number as a ship's crew. The general view is that an army would have been made up of a number of warbands under a senior chief, or Althing, and would have been between 200 and 600 strong. Pictish Stone at Aberlemno Church Yard. 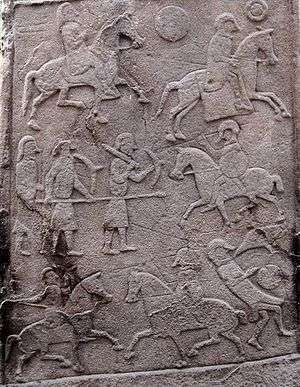 The stone is believed to commemorate the Battle of Nechtansmere, where the Picts destroyed the Northumbrian army. The figures to the right show Anglo-Saxon mounted warriors wearing Coppergate-style helmets and these are unambiguously shown fighting from the saddle. The only unmounted Anglo-Saxon warrior depicted is dead, as indicated by the carrion bird near his head. The organisation underwent considerable changes, becoming essentially more feudal. The Gedriht became a more organised household guard, which provided a core of military specialists (the huscarls). Individual Earls would have had their own household troops. There is also a new class of lord, the Thegn, which was roughly the equivalent of the later Norman Baron: Thegns held land from the king and were responsible for raising the Fyrd in their area and leading them into battle. The richer Thegns would also have had their own household troops. However, the major innovation is in the organization of the Fyrd. This, in the post Alfred period, is called up in groups either to man the Burhs (each burh had a manpower level calculated according to the length of wall) or to serve in the field army. By this process, a Saxon army could remain in the field all year as there are always enough men at home producing food and goods. The army was thus significantly larger than in the early period. In addition, by the 11th century, the increasing wealth of England, its increased centralisation, and its growing class of freemen meant that helmets, weapons, and armour could be made in far greater numbers. This meant that, by the 10th century, laws appear to have required a freeman who had the financial means to own a spear, a shield, an axe or sword and a helmet. The laws of the day required Fyrd members to be men of a particular class, freemen, who could afford decent equipment and training. Weapons and equipment remained broadly the same, although the majority of a warband now had a helmet. The Dane Axe, which required a great deal of training to use effectively, became increasingly popular with the huscarls. Anglo-Saxon battle tactics have also spawned much debate. Some historians believe that horses were used, though most argue that the battles took place on foot. Infantry battles are reported in many texts from the period. Anglo-Saxon military organization is difficult to analyze. The combat strength of the Anglo-Saxon army is another issue that cannot be agreed upon by scholars. Some historians argue that the army was weak and only used infantry as a means of defense and attack, while cavalry were only used for scouting, whereas others believe that the army was more powerful, employing infantry and cavalry. The former argument suggests that the infantry was of a high standard but did not have the capacity to press home an advantage, due to the lack of cavalry. It was also suggested by historians until the 1980s that the Anglo-Saxons did not carry high quality weapons. 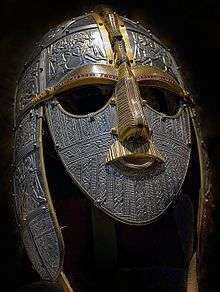 Since the 1970s, however, archaeologists and historians have created a more varied view of Anglo-Saxon armies. The early Saxon armies are now thought to have been very formidable indeed, specializing in high-intensity close combat. The large shield was an offensive weapon as well as defensive. In the later period, the Saxons adopted the Danish battle axe, which had a 1.3 m shaft and could decapitate a horse or break up an opposing shield wall. There was no cavalry in western Europe capable of consistently breaking a well-ordered shieldwall, aside perhaps from the Byzantine Cataphracts. This was due to the relatively small size of horses, and the fact that, even with the advent of the couched lance in the 12th century, well disciplined spearmen still presented a major problem for cavalry. This was demonstrated at Hastings when the Normans, who probably were the best cavalry of the period, tried all day to break the Anglo-Saxon line. To judge the effectiveness of any military formation one first needs to determine what was its function. The early Saxon armies were aggressive small raiding units that could be quickly combined in a larger unit to take land and goods. The later army's function was defensive and was the military expression of an organised state. It not only depended on raising manpower through the fyrd, but on a network of burghs that provided supply bases and mustering points. It was this system that allowed Alfred and his successors to conquer England and for Harold to move his army rapidly against the Danes and defeat them at Stamford Bridge then move elements 250 miles south to Hastings. There are some battles in which scholars generally agree on which tactics and methods were used. The Battle of Hastings, in 1066, demonstrates some interesting military tactics. At Hastings, the soldiers were organized with the best soldiers in the front line and the less adequate fighters in the following lines. They formed a tightly packed shield wall, with spears projecting from the front rank over the shieldwall. Protecting the areas behind and to the side were a small number of archers, javelin throwers and slingers. The Bayeux Tapestry also shows armoured Saxon warriors using the long handled Danish axe. Either they stood in front of the shield wall or the wall opened to let them through. Though this formation has been criticised, it was highly effective; it provided reasonable cover from missile weapons and was capable of fending off most cavalry. It also needs to be remembered that all the Saxons needed to do in order to achieve victory was to hold their position until sunset, and the Normans would be forced to break off the days fighting. The Normans, deprived of supplies and reinforcements, be penned into a small area and with no way of feeding themselves or their horses, would have been forced to retreat. It was, in fact, rather effective at repelling the Norman Cavalry and it was only the death of Harold and his brothers, probably towards the end of the battle, that caused the Saxon command system to ultimately fail and the battle to be lost. This strategy was also used in the battle of Sherston in 1016, only with a slight difference - instead of simply holding position, the army advanced on the enemy while maintaining their solid formation (A refinement of this tactic was used in the crusades: as the army neared the enemy line, gaps would open in the 'shieldwall' through which the cavalry would charge). Military tactics did develop gradually throughout the Anglo-Saxon period. Though there is still much debate as to how efficient the soldiers and the fighting was, it is clear that, as the ages progressed, so too did the power and capability of the army. Campbell, James, Eric John, and Patrick Wormald. The Anglo-Saxons. Ithaca: Cornell University P, 1982. 59-201. Fisher, D J. The Anglo-Saxon Age. Aberdeen: Longman Group Limited, 1973. 220-340. Hollister, C. Warren. Anglo-Saxon Military Institutions. Oxford: Oxford UP, 1962. 18-152.